Agnes Dean was a cabinetmaker. That’s a somewhat startling piece of information when you consider the detail. A woman and with the name Agnes, would put her back somewhere in the early part of the twentieth century. Furniture making, of course, was the preserve of men, along with all the other ‘manly’ professions. To be born female and in 1920 or thereabouts would be a recipe for the predetermination of one’s role, clearly defined and limited to the narrow confines of domestic help, nursing or occupations of similar ilk. But Agnes broke the mould in conservative England where social parameters were rigidly set and strictly followed. What helped Agnes Dean was the fact that her foray into an exclusively male domain happened during the war years where all the traditional gender roles, of necessity, were, at least temporarily, abrogated. Men in large numbers conscripted for war meant shortages on the home front which were filled by women, who kept “the home fires burning”. Thousands worked in munitions factories for which Rosie the Riveter was the poster girl. They drove trucks, served in combat roles and engaged in the dangerous work of the resistance. Women, in a sense, came of age at the time as a result of new social freedoms sanctioned because of the war. Dean was one of them and she took up her woodwork and carpentry skills with enthusiasm, exhibiting an aptitude for not only design but for things that went beyond simple functionality. She harboured a closet desire for the modern and the avant-garde. She was thus a cabinetmaking hankering to be an artist. After the war she immigrated to New Zealand where she set up shop in a back-shed studio, creating one-off furniture pieces for friends and family along with a list of wealthy clientele. But in secret she was fashioning “art” objects, functionless prototypes which were never revealed to the public. Their existence was only known because she mentioned them in conversation with close friends, referring to them as her “dalliances”. Two New Zealand artists, based in Hamilton, have taken on the project of celebrating, acclaiming and validating the work of Dean. Stephanie Chalmers and Emily Rumney, (collaboratively calling themselves “Round Two”) in a show called Dovetail Dreams, (in association with the Museum of True History), have speculatively ‘recreated’ and liberally interpreted the domestic dalliances of the 1940’s cabinetmaker. 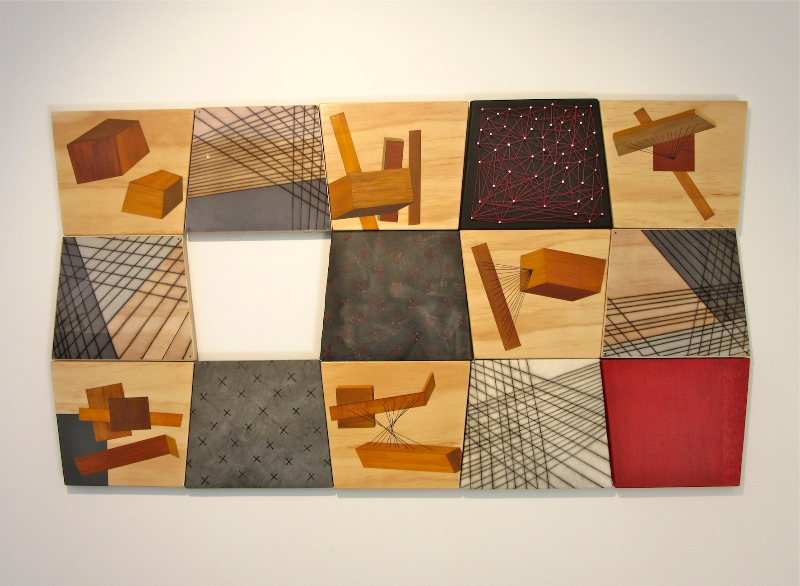 These were recently exhibited at David Lloyd Gallery, Hamilton, and featured twenty two immaculately constructed works in wood that presented hybrid shapes falling somewhere between abstract sculptural objects and forms associated with the world of furniture making. Impeccably fashioned with a flawless finish, these crossover works possess a touch of the surreal. One thinks of Marcel Jean and his Tree with Drawers, or Jean Arp’s playful concoctions, only treated with a much more precise and polished finish. The standout piece in the show gives its name to the exhibition, Dovetail Dreams, a configuration that would make any cabinet maker proud. Looking like a demonstration piece, its inlaid series of cubes and overlapping rectangles recalls something out of the stable of Malevich. Made up of 14 different interconnecting panels involving subtleties of wood colour and notations of crosses, lines and dots that abstractly reference furniture forms, it is a tour de force. The same allusive quality is manifest in many other works in the show. 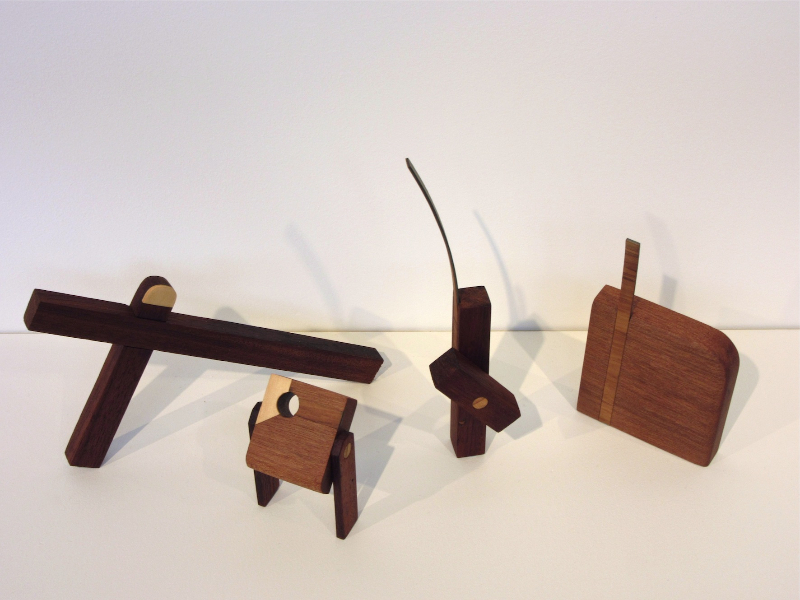 Joint Test Family comprises four sculptural wooden forms that cleverly echo the appearance of woodwork tools in diminutive proportions, while Wood Strip Sampler displays a configured array of long wood pieces, worked up and mounted on the wall in such a manner as to suggest ancient artefacts. 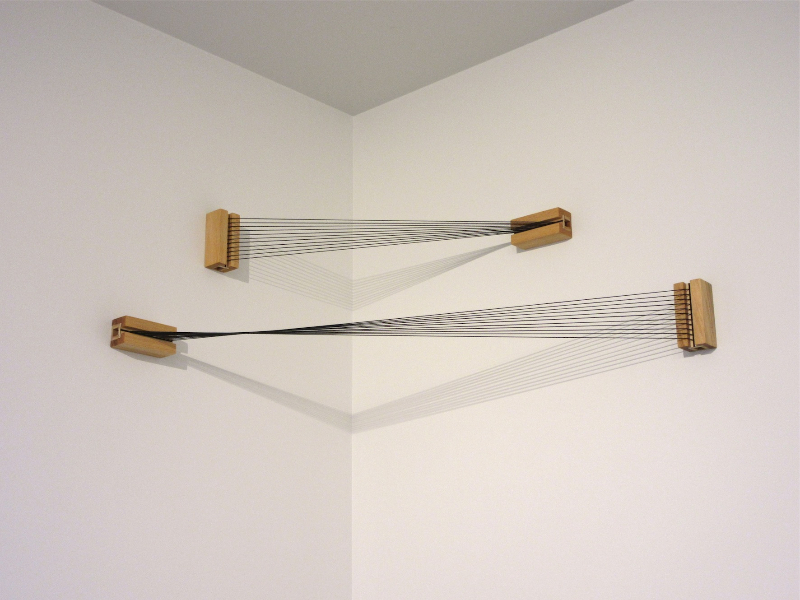 There are several pieces that involve stretched cord, like Small Stretchy 1 & 2, and it in these works that one finds the definitive presence of Barbara Hepworth. This homage to a forgotten artist, a woman out of her time, is a beautiful and exquisite exhibition, finely wrought and a fitting tribute to someone who may otherwise have been overlooked and lost to history.